Despite many alternative methods already used for testing of 8,000 cosmetics ingredients that are already proved safe and freely enter the market, Procter & Gamble (P&G) continues with the horrible tests on animals for the sake of profit. P&G, with more than 250 brands, is responsible for tormenting and death of thousands of animals per year, victims of painful, old-fashioned and completely unnecesary experiments. P&G admit conducting poisoning tests on animals to assess chemicals in their brands which include Ariel, Dreft, Lenor, Olay, Max Factor, Fairy, Pantene, and Herbal Essences. If hundreds of other companies are able to produce cosmetics and household products without animal testing, why cannot P&G? To draw attention to the unethical pratice of this multinational company, Animal Friends will join the 12th annual Global Boycott Procter & Gamble Day, led by the international animal protection group Uncaged and in partnership with dozens of animal protection groups around the world. Over 140 events will take place across the world, from Sydney to Stockholm. The campaign is supported by stars such as Sir Paul McCartney, Pretenders lead-singer Chrissie Hynde, poet and musician Benjamin Zephaniah, and singer Morrissey. The events against P&G in Croatia will take place in Rijeka and Zagreb. Event in Rijeka will take place on Thursday, May 15, at 12 noon on Korzo near Republic of Croatia Square. 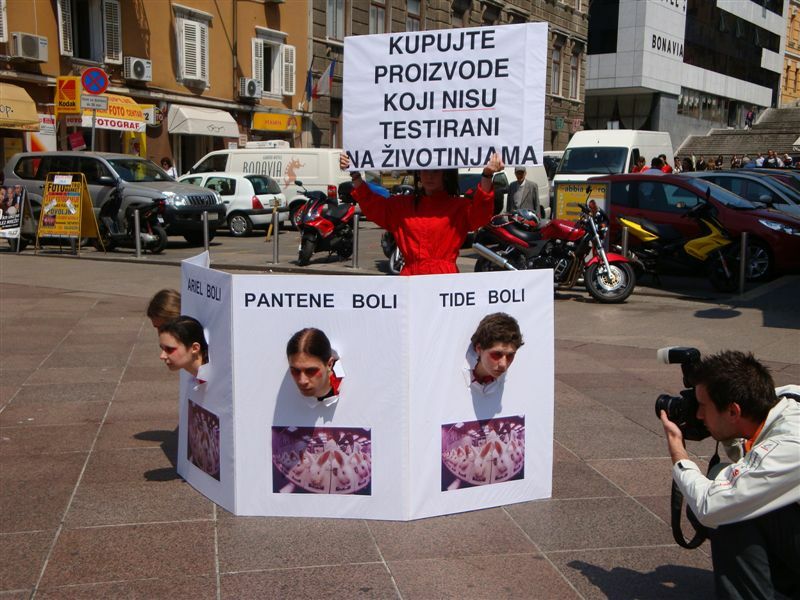 "Immobilized" activists with visible "wounds" on their faces will represent so-called Draize test of eye irritancy, in which chemicals are applied to the eyes of the rabbits. During a period of several weeks, reactions in the eyes are monitored – bleeding, damaged cornea, and blindness. On Friday, May 16, and Saturday, May 17, on King Tomislav Square besides the info stall a video footage of animal experiments will be shown. 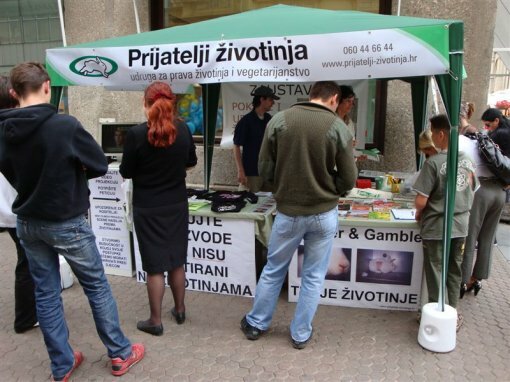 Also the leaflets with the White and Black List of companies whose products can be bought in Croatia and which are not/tested on animals will be handed out. Typically, each animal toxicity test involves force-feeding chemicals via a tube inserted down the animal’s throats. This can easily damage the throat and organs of the animals, as well as cause suffering due to the toxic effects of the chemical. Those animals that survive to the end of the test are then killed for tissue analysis. 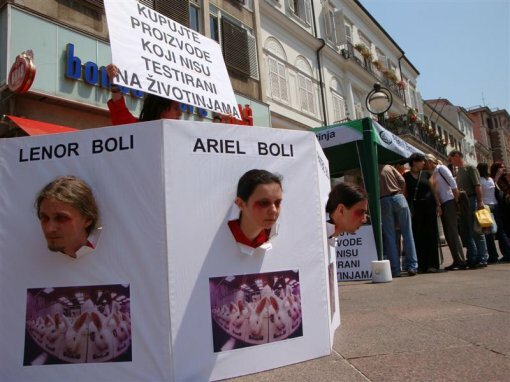 Luka Oman, Animal Friends president says: "These days we are appealing the public to the suffering behind famous brands such as Ariel, Max Factor, Olay, Head & Shoulders and even IAMS "pet" food. Once the public is aware of these facts, the huge majority of the public will not want to have anything do deal with such brands and change their shopping lists. The more people join the boycott we are getting closer to saving thousands of animals from P&G's painful and deadly tests. Each person can make a difference by avoiding P&G." 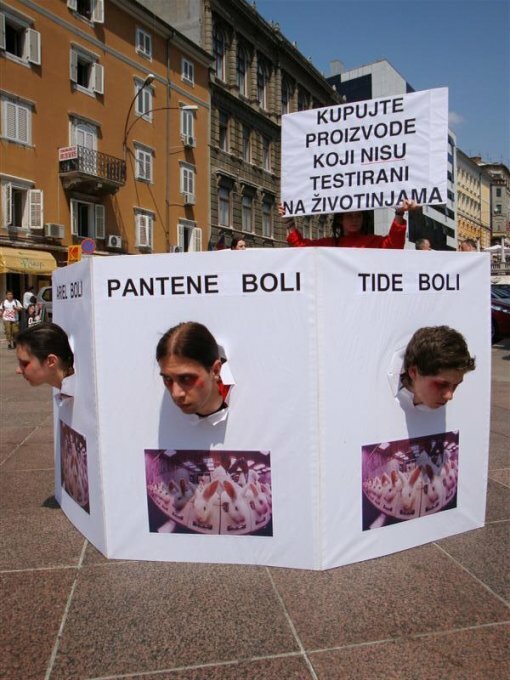 On the 12th annual Global Boycott Procter & Gamble Day, Animal Friends invites citizens to become more conscient consumers and by choosing products that are not tested on animals and boycotting those who conduct horrible animal experiments show P&G and other unethical companies what they think about torture and slaughter of animals for profit. In the same way Animal Friends also invites the chain stores to think about their reputation by not cooperating with this notorious company.